The Saint Michael Catholic Church Pastoral Council is hosting a breakfast Sunday, May 31 for graduating high school seniors at 9:30 a.m. in the Knights of Columbus Hall. Letters are being mailed inviting seniors and their families. 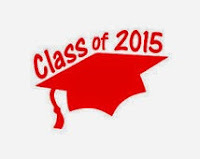 Should a senior not receive the letter by Friday, May 22, please contact Kathy #2 at the Rectory at 936-4935.